Scar revision can help diminish the appearance of scars by evening out tone and texture. Surgical technique, how an incision is closed, and your genetics can all contribute to your resulting scar. Scarring from injury, trauma, or skin conditions such as acne can be greatly improved with scar remodeling techniques. The right skincare products can greatly reduce the appearance of scars or enhance results from laser treatment. Scars are an inevitable part of life. The formation of scar tissue is our body’s way of healing, and there is really no way to guarantee perfect healing from any scar. However, there are a number of treatments we can use to help modulate and direct surgical scar healing in a more positive manner as well as options to help correct and minimize scars from trauma, acne, or medical treatments. During his residency training, Dr. Buford was exposed to a variety of approaches for scar optimization and noted that every patient seemed to heal a little differently. As such, what worked for one person was not necessarily as effective for the next. Dr. Buford continues to adopt a personalized approach to scar care, and he has developed a suite of innovative scar remodeling techniques to help a variety of patient concerns. Dr. Buford has found that a combination of fractional CO2 laser resurfacing and topical steroid application is an effective method for reducing the appearance of post-surgical scarring. Six months following surgery, Dr. Buford determines if a patient’s scar will benefit from remodeling. If so, a series of three to four treatments are scheduled, spaced two months apart. This is followed by at-home treatments of SkinMedica’s TNS Recovery Complex, which should be applied to the scar twice daily for several months to help aid in the remodeling. 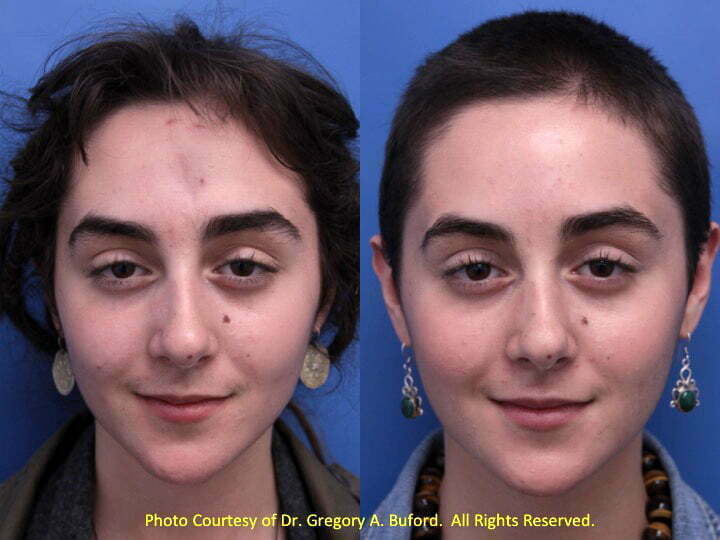 Dr. Buford bundles the price of laser scar remodeling into each surgical procedure. Skin conditions such as acne and certain medical treatments such as steroid injections can result in conspicuous indentations, as fibrous scar tissue draws the skin downward, creating a depressed scar. Such scars typically require subcision, or a minimally invasive procedure that involves gently releasing the fibrous tissues beneath the skin. This allows the skin to revert into a more normal position. 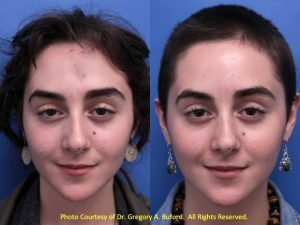 To see a real patient example of how Dr. Buford has helped individuals improve scars with subcision + dermal fillers, read this post on Dr. Buford’s blog. Smaller scars from injury, stretch marks, and acne scars can be significantly improved with Dr. Buford’s state-of-the-art nonsurgical treatment that combines microneedling with an infusion of ProCell growth factor serum. By making a series of tiny, undetectable punctures in the skin, microneedling stimulates collagen and elastin production to naturally repair skin cell damage. An infusion of ProCell MicroChannel Delivery Serum immerses the healing cells with natural growth factors and cytokines derived from stem cells to accelerate healing. Dr. Buford can also incorporate platelet rich plasma (Eclipse PRP) treatments to accelerate skin renewal. To learn more about scar remodeling options or to schedule your consultation, contact us today!